« SSMT 2017: Verse 8! Recently on social media I slammed what I called “personal branding” and included a screen shot of a piece of a text conversation in which I not only said that all the personal branding out in the social media world made me want to puke (it does) but so did the “people of the brand.” The latter was pretty stupid since I made no attempt to define what I meant by personal branding or to identify whom I meant by the people of the brand. In one broad sweep, I inadvertently threw the whole Christian publishing world under the bus and, this, after working with teams of godly people in publishing who were not remotely on my mind. Forgive me for that. The slam was toward what I see as a deadly viral infiltration within a much larger force that, for lack of a better label, we often call the industry. This term, too, is unfairly broad-sweeping because there are individuals working within it with godly character, motives and practices. Good Lord, I want to be one of them and clamor and struggle and fight to be among them. Sometimes I win the fight for my soul and other times I don’t. But the tweet started a conversation online that went on for days and made it obvious to Karen Swallow Prior (who also published an article today) and me that a nerve had been hit. We watched dialogues ensue between many women out there who are frustrated, trying to do what it takes to build a platform and yet avoid getting sucked into the maelstrom. This post is to give a little more space than Twitter can offer to the subject. I’ll try to be as straightforward as I know how in what I meant by personal branding and should have made clearer at the time: Self-sales. By the people of the brand I meant those who do it ad nauseam and those who train, coax, pressure or help people to. I’m not talking about selling books. I’m talking about selling ourselves, though let’s admit the two can be about as easy to separate as the peanut butter and jelly in your sandwich. Selling our souls doesn’t always involve money. I could sell my soul just for the power of having a blog that attracts hundreds of thousands of readers. It’s about notoriety, an understandable and legitimate goal out in the world market. But we are Jesus followers. We’re attempting to sell ourselves in the name of Jesus. We’re being tutored in the post-Christian modern art of self-glory for God’s glory. We’re intentionally building up followers and followings for ourselves and excusing it and confusing it with building up the church. I know, I know. We’ve all heard this a thousand times. The thing is, “necessary evil” is still evil. I don’t think that excuse is flying with Jesus. For Jesus-followers, “necessary evil” is an oxymoron. If we don’t push back against this mudslide, the church will become the Tower of Babel with a cross on top: an assemblage of people who’ve been successfully seduced into thinking it’s perfectly acceptable to hammer daily in the public sphere building up a name for ourselves in Jesus’ Name. We’re trying to become godly versions of 2 Timothy 3:2-4. 2 For people will be lovers of self, lovers of money, proud, arrogant, abusive, disobedient to their parents, ungrateful, unholy, 3 heartless, unappeasable, slanderous, without self-control, brutal, not loving good, 4 treacherous, reckless, swollen with conceit, lovers of pleasure rather than lovers of God. We’re out there in front of the world trying to be godly lovers of self, godly lovers of money, godly proud and arrogant, godly slanderous, godly brutal, godly treacherous, and godly conceited and godly about how we love pleasure more than we love God. We’re fighting a losing battle at the cost of our souls. There is no godly way to self-promote. Yet God’s way of spreading the hope, truth and life of Christ is still through people and, yes, in part by making use of their personalities. Sometimes it’s a fine line and it’s up to each of us to learn how to identify when we’re crossing it. We’re people of the Spirit. If we yearn for Him to, plead for Him to, He will be more than happy to cause us to gross ourselves out when we’re doing it. I ask for it just like that. In those words. Ask to know quickly. Ask to know before you post or even seconds after it. Maybe one of the godliest features in all of social media is “delete.” Also trust your gut when you know you’re being advised to do something in order to build a following or sell a book that feels gross. What troubles me most is that I believe many individuals start with a pure heart and God-infused desire. We deeply want to communicate the gospel of Jesus Christ and testify to His greatness, His goodness, His grace, His cross, His forgiveness, cleansing, healing and love. All these avenues – books, blogs, podcasts, live broadcasts, social media posts and so on – offer tremendous means of communicating the gospel and, with diligence, some actual discipleship. But I’ve been neck-deep in this now for well over 30 years. I’ve lived long enough, experienced enough, witnessed enough and heard enough to tell you point-blank the devil doesn’t take a potential threat to the darkness lying down. He can’t sleep with a light on so he does everything he can to cover it. If he can’t get us to quit, he’ll settle for making us hypocrites and narcissists and, in the wording of Galatians 3:3, what we started in the Spirit we end up finishing in the flesh. The seduction we’re talking about here is being known. Seen. Heard. To be worshipped would be the ultimate but that may be too obvious. The sickest part is that we’re being intoxicated into thinking that all of this is to make Jesus known. Self-promotion becomes justifiable as the means to the end-goal of Jesus-promotion. And yet this is the world you and I were entrusted with the gospel of Jesus Christ to serve. I don’t know what you’re going to do with all of this. I’m probably not going to drop off social media any time soon because it’s one of the most effective ways of reaching people that we have ever had at our fingertips. I’m also probably not going to make all my posts blatantly gospel-oriented because, for me, that can become just as showy and smug and, if it’s all I do, I lose access to the very people I hope most to reach. I try to retain some common ground (TV shows, for instance) if I want people on the other side of the street to occasionally come sit in my yard and visit. This may not be your way but it’s mine for now. It’s not without risk but none of this is. I’m going to keep trying to live a tiny sliver of my life out there on social media in hopes Jesus will be evident in my teaching, relating, writing, dialoguing, mothering, grandmothering, friending, suffering, questioning, laughing and crying. And I’m going to plead with God every morning to help me die to my own rotting flesh and live in His Spirit and not misuse my big mouth. And I’m going to try to sit at this social media bar for a few minutes every day without becoming an alcoholic. If I can’t do it, I’m going to quit. Or at least go into rehab. Because this place is deadly. I don’t have tidy solutions to offer in this post. What shifts into sin for one person may not be sinful for another. God looks at our hearts. Knows our motives. He’s onto our bull. He alone can call out a well-played humble brag. All I know how to do is repent on my face for my own sins and catch myself in my own self-promotions. There is a way to do this, I think. It’s just expensive. It just won’t be the money-maker or the power broker going forward that we could acquire if we do the Jesus-thing the world’s way. All who push back will take a pay cut, whatever form of currency their pay may be. The answer will be found in serving God as faithfully and as purely as human hearts and souls know how and let Him build His own following and determine who listens to what voice and when. As the saying goes, let each of us tend to the depth of our ministries and let God tend to the breadth. The fight will be fierce and let me promise you this: should Jesus entrust you with a large platform for a season, you will never be more at risk of compromise and cowardice than when you are at the top tier. You may reach some heights doing the honest-to-God Jesus-thing but the greater temptation will be the attempt to stay on top. What goes up must come down. Fight it and you’ll make a fool of yourself. Stay steady on your feet on the Merry-Go-Round and you just might still be standing when the music quits playing and the amusement park closes. I want to make it. I want you to, too. I want to get to that finish line keeping my eyes on the One waiting for me there. I want to love Jesus with everything in me and serve Him audaciously and faithfully. I think it’s possible out here. I just don’t think it’s probable. It will only happen for those who are willing to fight their flesh to the death by the power of the Spirit holding tight to His Word. This is what I know for certain. It would be unspeakably better for us to drop into obscurity than sell our souls. We may have to make the biggest sacrifice in our entire social media culture: we may have to settle for being unknown. 3 We put no obstacle in anyone’s way, so that no fault may be found with our ministry, 4 but as servants of God we commend ourselves in every way: by great endurance, in afflictions, hardships, calamities, 5 beatings, imprisonments, riots, labors, sleepless nights, hunger; 6 by purity, knowledge, patience, kindness, the Holy Spirit, genuine love; 7 by truthful speech, and the power of God; with the weapons of righteousness for the right hand and for the left; 8 through honor and dishonor, through slander and praise. We are treated as impostors, and yet are true; 9 as unknown, and yet well known; as dying, and behold, we live; as punished, and yet not killed; 10 as sorrowful, yet always rejoicing; as poor, yet making many rich; as having nothing, yet possessing everything. The Holy Bible: English Standard Version. (2016). (2 Co 6:3–10). Wheaton: Standard Bible Society. This entry was posted on Thursday, April 20th, 2017 at 9:42 am	and is filed under Uncategorized. You can follow any responses to this entry through the RSS 2.0 feed. You can skip to the end and leave a response. Pinging is currently not allowed. I just love you Sister Beth! I just love you. You always cut to the “spiritual chase” and either say what my insides are screaming, or make me ask myself why they’re not screaming. As I venture into the land of using media to share my story of a healing, all-powerful, unconditionally loving Abba Father, I thank you for your words of warning and caution and TRUTH. I will copy and read this often as a check of where my head and heart are. And pray the Spirit will use this and all the means possible to keep this about Jesus and not about me. Thank you!! This touched me so deeply! As I shared with the my fellow (ette) LIT sisters, I have struggled to put into words what the Holy Spirit was speaking to my heart for awhile now, but you confirmed exactly that. Oh my goodness, how I wrestle with this. My desire to share the Word of God often competes with the inward desire to have me be recognized while doing it. I am grateful that I have not reached great success in the latter, for it makes the former all the more authentic. We DO all want recognition. Our souls crave being noticed and appreciated and yes, technology has allowed us to feel like we’re seen. People respond with “like” and “love” and comment on our posts and tweets and it feels good. It is like a drug for the soul instead of the body. Yet the Lord is the only One who can truly satisfy. To be seen by Him is to be KNOWN by Him, which is what we crave; intimate knowledge of our hearts by our Creator… and to be LOVED by Him anyway. Lord, may all of us find our hope, our joy and satisfaction in seeking You alone. May You be glorified by and through our lives, that others may know you. May we be the conduits to YOUR glory, not our own. Very well written, “Miss Beth”! “Authentically Honest/and humble”, in regards to your pursuit of following Jesus, and His Ways; and, in your Bible teaching . . . This post is a definite, resounding ‘AMEN’ from me! I’ve put my blog on hold. Waiting for affirmation or a change in path. But, seeking Him all the way. For about a decade (maybe more) peoples’ motivation has morphed from money to fame. Gone are the days folks wanted to be doctors and lawyers. Now we want to be Kim Kardashian or Honey Boo Boo. But not everyone can be famous. Can we accept obscurity? Is a regular, mediocre life to be avoided at all costs? The fact is, we think people care about us and what we do. For the most part, they don’t. On the flip side, we think God doesn’t care about us and what we do. But Friend, He so does. Can we be okay with that? I attended a 2 colleges that called themselves “Christian” and I was taught in divisive ways that the Word of Truth was not the firm foundation that I later found it to be. I am VERY careful about who I let my mind and heart be exposed to. With good reason. There are so many who are being used by the one who wishes to “kill, steal and destroy.” It can be so subtle. Sometimes the same “Brand” can go from safe to very dangerous and Jesus diminishing in a millisecond. My young faith was so messed with. I realize that you are describing something that is very messy in this marketing world but I thank God that I can know that I am spiritually safe until given a reason to be on alert when I listen to you or do one of your studies. You have earned my trust through the years. You can lose it-if you lose it. But you would agree with the “Berean” Acts 17:11 method and I love you for that. Because you have always said that we should all hold our words to that standard of comparing to Biblical Truth. I am a Christian, Jesus loving, Bible believing United Methodist. I need to know who I am listening to. I need the Holy Spirit to help me discern. I am in Women’s Ministry and I need to able to help others know who is generally safe to sit under the teaching. We desperately need our authors to be vetted. I thank God that I know who you are. It is interesting that one of the women who has used your words perhaps in a strange way in the media recently is someone who I sat under by doing one of her studies about 3 years ago. 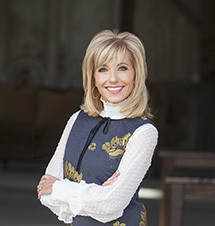 When I did, there wasn’t really anything specific that I remember that was “off” but it spiritually felt “off.” The idea of acting out goodness was in the study-alot- but honoring the One who created goodness and the Truth foundation for what she was saying wasn’t there. I realized then I very likely wouldn’t read or study under her again. I’m glad she had a brand so I could know this and not expose my heart to her work. There were others in the Bible study choices I would study under first and I’m glad I did. Here we are several years later and yep, here we are. I’m not saying I’ll always get it right but I need help knowing quickly where to not even visit. In this case, branding, if that’s a proper use of the word, was helpful to avoid what felt more like junk food instead of true, spiritual nutrition that honors The Great I Am. I’m glad you search your heart and motives. I need my leaders and mentors to do that. I’m 57, having my 3rd surgery-cancer related-next week, love Jesus and don’t have time to not know as much as possible who I’m listening to. Thank you, Beth. I am so excited to share Jesus over coffee with you in heaven. It doesn’t look like the “wheels are going to fall off” for either of us any time soon but when they do and we go to Glory full time what a Party that will be. I esteem Jesus and love you like the long distance sister that you are to me. I thank you and the others who walk by your side. I hope you are of good cheer. Your work representing the cause of Christ has been so fruitful. And, I am thankful that I know what your faces look like and Who your words honor. THANK YOU so much Beth. I have long felt God’s calling to write but have been paralysed as a (Christian) writing course I’ve been following has essentially suggested that a platform is required. The dilemma I’ve been in is I feel in the depth of my bones that I need to minimize my time with social media. It has only ever distracted me from the path I want to follow, that of following Jesus earnestly. I have been praying for God to remove my fear of social media and for faith that it won’t lead to distractions. But now you have shown me another way. If something I write is used by God to touch only one person, then that is why God called me to be a willing tool in His hands. Your post has given me a huge sense of relief, and I truly believe God is speaking through you, loud and clear. I’m going to print this off and put into my journal as a landmark. Praise God that He still reached me with this message despite my limited access of social media. I don’t usually comment–but this struck such a tender cord. As an author of books this is the torment of my spirit–share or keep to myself. It’s God’s blessing to be published. Yet, with this gift, the publishing world places marketing in the hands of the author–so terribly rough. I struggle with this so much. I want to be faithful. I want to hear well done. I doubt the Lord has told anyone “cool viral post”. This topic is so timely to me. I recently attended a personal branding seminar series. Some things resonated and much didn’t — mainly because it did seem so very much self-focused and narcissistic. It feels uncomfortable because it is a slippery slope. I like the idea of actively thinking about my reputation and who I want to be (although I’m old enough that I probably should have a better idea by now — haha!). But it’s (mostly) based in who I want to be as a representative of the body of Christ and the church. I desire that God make me more and more like Him day by day. It’s not to place focus on what other people think of me personally but the (sometimes) burden I suppose I place on myself that my reputation, or how I’m branded, reflects how others may perceive what a Christian “looks like”. I recognize though that there is a selfish and prideful component to that thinking. I also suspect for those who are more directly tied into the Christian ministry “industry”, so to say, it could feel like a no-win situation and that people who want to will always find ways to criticize the level to which one chooses to place herself anywhere along that slippery slope. I’m lifting up prayers now for those of you who are called to live a life in Christ that also puts you under a magnifying glass. Your post, Beth, is a great reminder for all of us, or at least me, to actively keep in mind that our culture can lure us into a level of personal branding that contradicts who we are called to be as followers of the way. Amen & Amen! Thank you for sharing some sanity with your sisters in Christ! Beth, I did not read your whole blog, but I just tried to get off facebook because of all the second hand news and sharing problems. I have to admit, I am guilty of sharing too. Since they made it so hard to exit facebook, I just unfriended everyone and said goodbye on my page. I realized facebook and news was taking me away from what was so important, Jesus and my Bible Study. I lead for my ailing leader and It has been a blessing. We leave on a trip and I feel like Paul. I have left people in charge and I will pray for them. I will send a letter before I leave, telling them how much I love them and how they must carry on. We are doing LIVING BEYOND YOURSELF again and I love your poetry. Beth – this is crazy truth. You have boldly spoken a sad reality for so many, so so many church-world leaders. This is so well articulated and expressed. It IS sad, but must be said and continue to be said. I repent just thinking about it. And I hope conviction spreads like wild-fire through our church world to do the same. It is an opportunity to do so, when truth is spoken. very well done sweet Beth. The issue of staying on top is one I’m glad you presented. From my observations, this seems to be a huge problem for many! Initially, there is a sincerity that over time morphs into something phony, ungodly, grasping to maintain a level or go beyond. So the envelope gets pushed and the line gets crossed and the rock star image and status emerge leading many innocent people into an extremely subtle form of idolatry. I pray for the leader and the sheep that are so tender and docile who follow blindly and in a few years wake up (if they do) and realize that all they have done is follow a star not a savior and their adulation and admiration has been focused on the wrong image. Hi Susan, your comment must have ended up in the trash by accident during moderation. We’re sorry for the mistake! Thank you for your input on the conversation. Blessings to you! I am just now reading this and I am blown away at how much I needed to hear this. It’s not the branding part really, but the way the darkness is creeping into everything around me including our entire country. Things that I should find love and encouragement in are just turning out to be scary. The verses and comment verses are so helpful. My “word” for this year is LIGHT and it was seeming very dim. It’s time for some scripture memory (I just listened to a video you did on the topic!) and sharpening the tools.